Exercise — it’s good for your mind too. Depression is widespread, affecting people of all backgrounds. Globally, more than 300 million people of all ages suffer from depression, according to the World Health Organization (WHO). Depression is the leading cause of disability worldwide, says WHO, and at its worst can lead to suicide. In the US, nearly 16 million Americans have experienced depression at some point in their lives. Women may be more susceptible than men, though the latter are less likely to report depression to their doctors. The National Survey on Drug Use and Health (NSDUH) found that approximately 8.2 percent of women and 4.8 percent of men in the United States are depressed during a 12-month period. According to the 2014 NSDUH data, depression is most likely to strike adults aged 18 to 25, though there is a second bump in depression rates among the elderly. 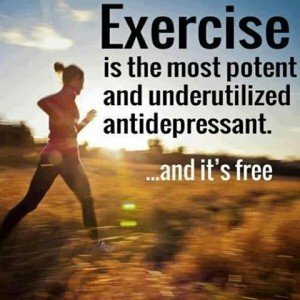 Though antidepressant medications are commonly prescribed to treat the condition, research shows that exercise is also an effective treatment. For some people, it works as well as antidepressants, according to Harvard Medical School. Like depression, anxiety symptoms also often improve with exercise, as does stress. Regular exercise releases feel-good substances — such as endorphins, seratonin and other natural brain chemicals — that can lift your mood and enhance your sense of well-being. Exercise also spurs the release of proteins called growth factors, which cause nerve cells to grow and make new connections. The resulting improvement in brain function makes you feel better. Though many people begin to feel better after just a few weeks of regular exercise, it is a long-term treatment that cannot be abandoned as soon as you begin feeling well. Aside from improving mood and reducing anxiety, exercise can have other psychological benefits too. It can make you feel accomplished and good about yourself. No one ever regrets or feels guilty about exercising. But we can experience those feelings as a result of not exercising. It’s easy to have regrets about drinking too much, eating too much sugar or other junk foods or just eating too much in general. But no one ever feels guilty about exercising; it’s positive and uplifting. Doing 30 or more minutes of exercise a day, three to five days a week, may significantly improve depression or anxiety symptoms, according to the Mayo Clinic. More-vigorous activities, such as running or stair climbing, may make a difference in as little as 10 to 15 minutes at a time. Performing exercises you enjoy, and a variety of them, will make you more likely to follow through and stick with the program. Simply put, enjoyment will lead to adherence and positive outcomes. Make sure to put exercise into your daily schedule, just as you would with anything that is truly important in your life. Finding a personal trainer can help keep you accountable and dedicated to a well-structured program, which will in turn make you feel better physically, emotionally and psychologically. If you exercise regularly but depression or anxiety symptoms still interfere with your daily living, see your doctor or mental health professional.